How does the Cash4Shooz no-calorie fundraiser work? A dedicated team of fundraising coaches. Tips and strategies to help you create a successful shoe drive fundraiser, and also learn about other marketing and fundraising topics. Promote your fundraiser and collect gently worn, used and new shoes from your families and community. Cash4Shooz will pick up the footwear from your location. Put the Cash4Shooz check to good use for your school, club or group. Where do the shoes go? The shoes you collect are taken to our warehouse processed, consolidated and shipped to developing nations where many cannot find jobs because of systemic poverty. 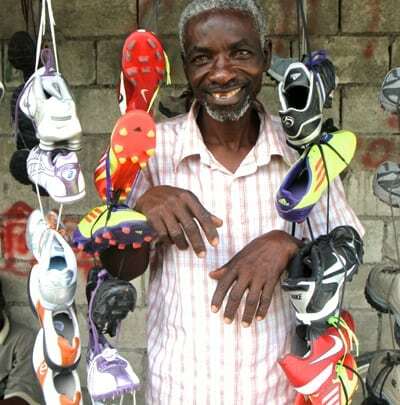 Through your shoe drive fundraiser, we can supply people merchandise to sell in their local marketplaces, creating small, self-sustaining micro-enterprises (small businesses). You collect shoes and receive cash for your cause. We repurpose the shoes and send them to developing nations. You help create employment opportunities around the world. Americans represent 5 percent of the world’s population but generate about 30 percent of the world’s waste. On average, each American produces just under 5 pounds of trash––daily. There’s a better way! Research shows that when repurposing is compared to the production of new products, we can reduce our carbon footprint and CO2 emissions significantly. Less production reduces the need for raw materials resulting in reduced waste. Your hand in repurposing shoes will help protect our environment, raise money for you and support families and people in developing nations to create self-sustaining economic opportunities. To read more about “Why Shoes?” please read our white paper “Why Shoes? The Story of Micro-Enterprise”, click here!